OMG! A windmill with graffiti! Ah yes, and the first of many more. The origin of this panel is as follows: wayyy back in 2008 or so, I worked in a call center in Los Angeles where I got to draw all day long whilst working. What is funny is that Anders Holm was in my group and then he went on to fame and fortune with Workaholics. I took this photo when we were all working. This led to a series of windmill drawings, of which I still own one. One is in Humboldt County, CA and never made it to the intended party, one was given to a friend in SF as thanks for saving me on a crazy road trip, one was sold in LA. I do not even have photos of all the them unfortunately. These have always been my favorite personal works of art (in my opinion) so it was time to step it up a notch and start painting them. It was hours upon hours and then some more hours of drawing time. 1. This I still have. 2. This one lives in San Fran. 4. Only a tiny image is left. The sky was always my favorite out of all of them. Update Sept. 12, 2018: Another one has been unearthed in the San Diego area. Thanks Crystal! Original image. I wish I knew the photographer but that info was lost. Further, I thought it would be interesting to figure out where this windmill is located. It is classified a “binnenkruier” meaning the mechanism to turn it is internal. That is the word I used to look it up. Lo and behold after diligent research, it appears to be in a series of windmills named Zijper Molens in North Holland near the coast. This particular windmill is most likely the “L-Q” windmill, formerly known as the “L” windmill because it sits on the intersection of two waterways, L and Q. All the windmills in this group do all look very much the same so it’s my best guess basically for the purposes of naming my painting with geographical information. Don’t think I will paint another from this series any time soon, unless it happens to be one of those above from the series of 4. 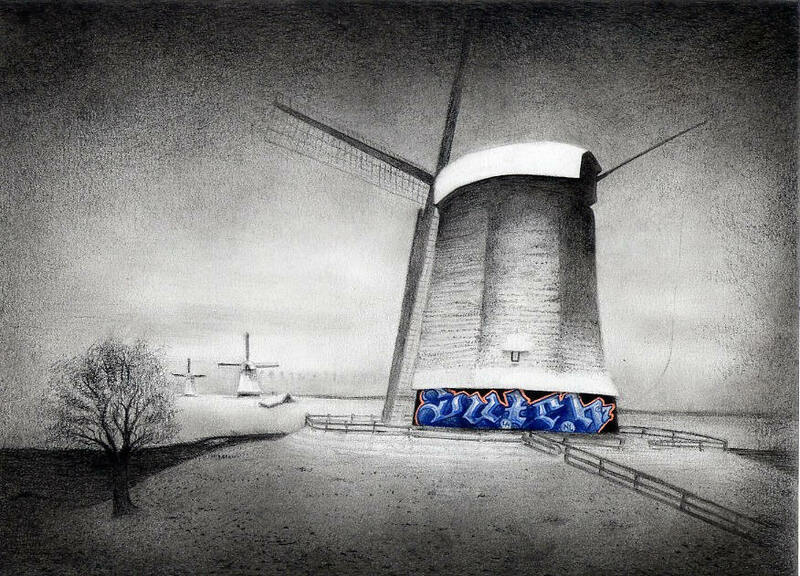 The painting isn’t 100% exactly like the windmill, because I changed some things for the aesthetics. The little boat is different, and the “walkway” down to the boat is actually where the water intake is, not really a walkway. I didn’t know that until much later into the painting when I saw the various photos about the series of windmills. Also changed the front a bit to accommodate the partially hidden “LUCY” sign. The window is also more sunk into the wall in the painting because visually it was more interesting than flat. Also added windows for balance. For those that want to see every detail, in my Flickr album you can have your wish. Just click here. It is a wrap-around piece with the sides painted. Title is along the bottom side. It was nice painting on super luxe canvases, but even nicer on Ampersand’s super fancy gessobord wooden panel. This is the largest size they offer by the way, which is a 36 x 48 x 2 inches cradled museum quality panel. Shout out to Rolf Goedman art store in the Hague for their exceptional customer service and delivery of said panel. Even bigger shout out to the person that paid to facilitate me having a fatty credit from this store. Locally, this painting is having a short stint in the window at Nielsen Gerlach Art in Hof van Delft right now. Free delivery in Delft. Thanks x100! This piece is available for purchase. The price is €1000 (euros), sales tax included plus shipping. It weighs about 10 kilos. Please send your contact information via my contact form if you would like to communicate with me about it. Thanks for reading my blog. Feel free to share this one to anyone you think has glaringly white walls and a grand to spend. 🙂 If one would like to see how this type of thing is shipped, please see The Twins are off to Chi-Town blog post. The best way to find out what I’m up to is to scroll wayyyyyyyyyyyyyyyy down to “GET CONNECTED” and provide your email address for updates directly from WordPress. Sharing is caring! The Panel upon Arrival Day. Look how happy I am. Previous This is B-I-G. Found something new in View of Delft by Vermeer. Next Vermeer and the Magnifying Lens.